The following comes from the introduction to Special Collections Instruction Librarian Amy Chen’s game based on book history. This game can be played with cards only, as an enrichment activity within a traditional course, or as a stand-alone class. Amy developed her game out of her interest in how gamification contributes to increased student learning outcomes in the classroom. Gamification offers students the ability to combine pedagogical challenges with play, motivating them to use fun to work through learning curves. To read a longer introduction to gamification, read Bohyun Kim’s “Keeping up with… Gamification” on the ACRL Blog. 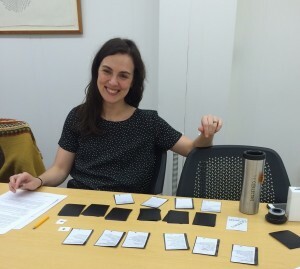 On Tuesday, March 8, Amy conducted a play test of the card version of the game. A play test is when the game is played in order to figure out how the game’s design could be improved. 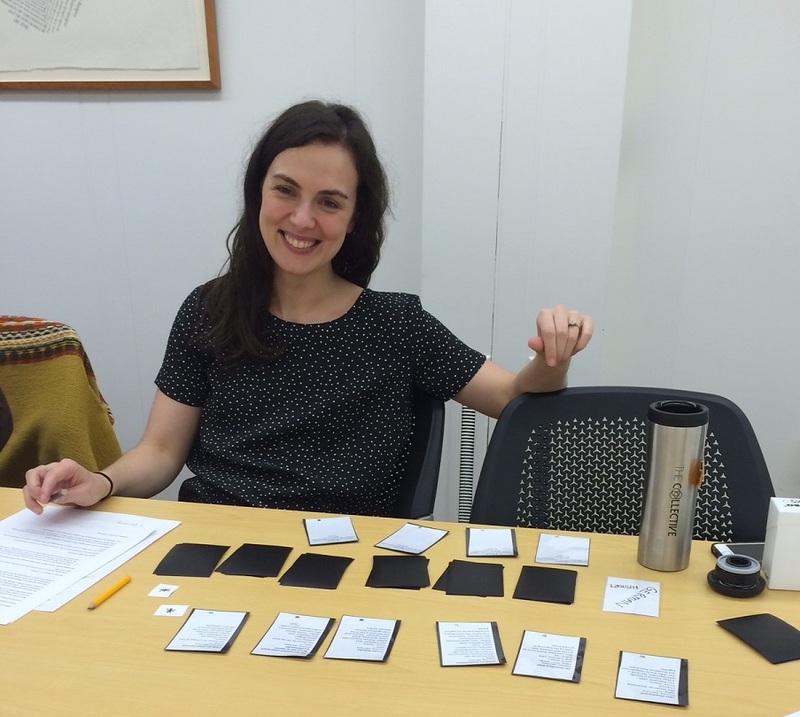 Eight librarians, in two separate rounds of play, contributed their feedback. 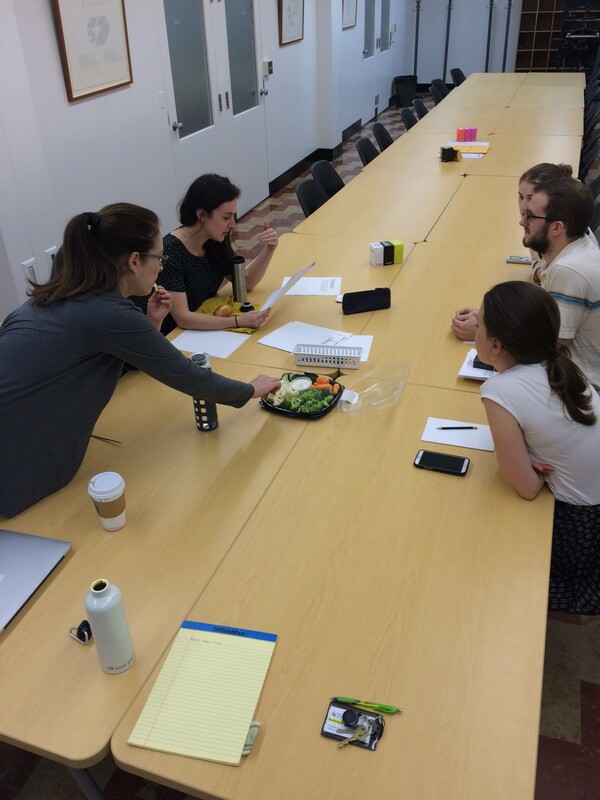 The first photograph is from the beginning of one of the play tests. The second photograph is of Katie Hassman, Undergraduate Engagement Librarian, who won her round. After revising the game back on the comments she received, Amy will be interested in reaching out to partner faculty who might like to integrate the game into their course discussions or assignments. If you are an instructor or faculty member at the University of Iowa and you are interested in learning more about the game or testing it for yourself later this spring, please email amy-chen@uiowa.edu. Additionally, Amy will be teaching an honors first year seminar (1 credit hour) this fall on book history using the game to structure the entire semester’s class meetings, readings, and discussion. You can follow the development of this game, which began in December 2015, by watching the hashtag #hotb on Amy’s twitter feed @amyhildrethchen.